Don't you just hate it when there's leftover coffee and nobody is going to drink it? That's why I bought one of these thermal carafes from Zojirushi. Now I just pour the leftover coffee from the glass carafe into this great invention. No more wasted burnt coffee. 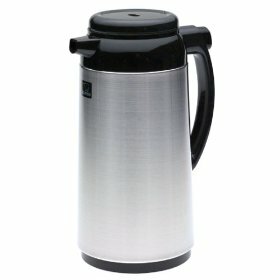 I was surprised to find out just actually how long this can keep my coffee hot. I come home from work to find out that the coffee is still hot. Now I can enjoy a hot cup of coffee without having to brew a pot when I come home.